February 14, 2018 / Modified feb 14, 2018 11:32 a.m.
An artists' rendering of what a plaza built around the bungalows could look like. The Rio Nuevo Multipurpose Facilities District is proposing it be given control of portions of some properties along Broadway Boulevard should the city of Tucson take control of them for a widening project targeting that street. Rio Nuevo is interested in redeveloping the properties in an effort to make the area into a destination for retail, restaurants and art galleries. 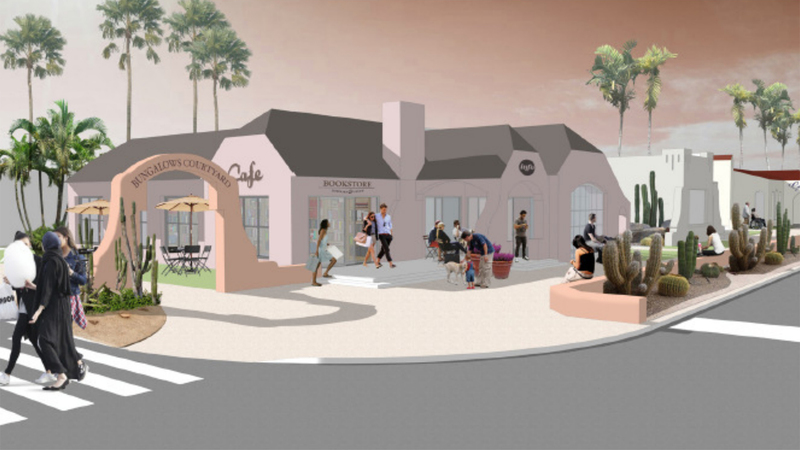 The city of Tucson has been acquiring properties along Broadway between Euclid and Campbell avenues as it prepares for a long-debated widening of Broadway. "Our interest is in what's called the remnant properties," Rio Nuevo Board President Fletcher McCusker told the Tucson City Council during a study session. "These are properties that ultimately would be acquired by the city and are affected by the roadway, but don't necessarily have to be demolished. Our interest is in repurposing them." McCusker said Rio Nuevo would find a private sector partner to help it rebuild properties, most of which are located between Highland and Martin avenues. Included in that stretch is a series of seven bungalows, two of which are already owned by the city of Tucson. "We can literally build a new pad behind them, stem out the electricity and plumbing and pick the house up and move it back." McCusker estimated the entire cost of the project to be under $20 million, all of which would come from Rio Nuevo and private partners. The city is still in the process of acquiring some properties along Broadway for the road-widening project. Sale of the property would require a council vote. Rio Nuevo rules require the district to buy property only from public entities, and at 90 percent of the assessed value. Rio Nuevo's proposal can be found here. MORE: Arizona, Business, Pima County, Downtown Tucson, Economy, Government, News, Politics, Transportation, Tucson, U.S.